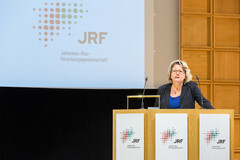 BICC Press/Events/JRF event "Flight, migration, integration"
You are here: Home » Press » Events » JRF event "Flight, migration, integration"
The Johannes-Rau-Forschungs-gemeinschaft (JFR) invited the interested public to its event "Flight, migration, integration—Challenges and opportunities from the research point of view" (in German) on 17 June in Düsseldorf. Svenja Schulze, Minister for Innovation, Science and Research of the State of North Rhine-Westphalia, gave a welcome address. All Photos: www.eventfotograf.in / © JRF e.V. Presentations by researchers of the JRF member institutes GDI (German Development Institute), BICC (Bonn International Center for Conversion), ZfTI (Foundation for Turkey Studies and Integration Research) and ILS (Research Institute for Regional and Urban Development) were in the centre of the event just like open panel discussions with the researchers and practitioners from migrant organizations, local communities and the state parliament (Landtag). Svenja Schulze, Minister for Innovation, Science and Research of the state of North Rhine-Westphalia started the evening off with the welcome address.